How did a rehab officer help veteran Brian Davies rediscover his passion for cooking. When veteran Brian Davies lost his sight, one of the biggest things he missed was being able to cook confidently for himself at home. But now, after receiving support from military charity Blind Veterans UK, he has been able to revisit some of his old skills and discover a love of cooking. 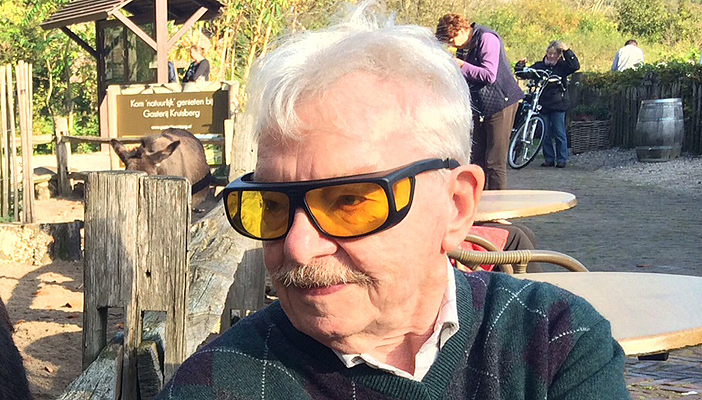 Brian began to lose his sight many years after he served in the RAF for National Service. He lost the central vision in his left eye first, before a blood vessel ruptured in his right eye further reducing his vision. At the beginning of 2014, Brian found out that he was eligible for support from Blind Veterans UK. He visited the charity’s Sheffield centre for an introductory week and returned again for a week of one to one training with Liz Hale, one of Blind Veterans UK’s Rehabilitation Officer for People with a Vision Impairment (ROVI), so that he could regain his confidence in the kitchen. Liz said: “Brian was really enthusiastic about his training and told us that he wanted to be able to cook safely again at home and he especially wanted to know how to make Spaghetti Bolognese. She worked with Brian throughout the week to find out more about the kitchen skills he already had, refine them and help him discover new skills and ways of doing things that would help him at home. Throughout the week, Liz and Brian concentrated on mastering basic kitchen skills, with Liz giving tips to help make the basics easier, such as drawing a figure of eight on the bottom of the pan when stirring or using a bridge grasp to safely slice vegetables. She also found out which pieces of equipment, such as coloured chopping boards to contrast with the food and talking scales would be most helpful to Brian.